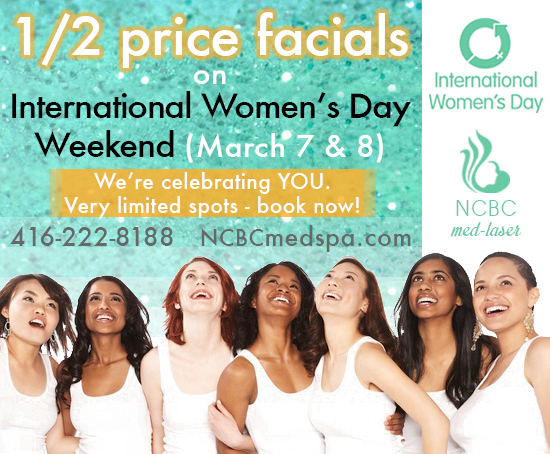 NCBC Med-Laser | Skin Rejuvenation Clinic in Toronto | 1/2 price facials on Women's Day Weekend! 1/2 price facials on Women’s Day Weekend! On International Women’s Day Weekend (March 7 & 8), we’re celebrating YOU with half-price facials for all the lovely ladies! We offer 6 types of facials for all skin types. Book now since spots are very limited! Call us at 416-222-8188. At the 5179 Yonge St. clinic only and by appointment only. Vitalizing eye treatment mask is complimentary with all facials. Learn about our remarkable facials here.